After her PhD-studies on the biology and pathophysiology of the developing skeleton (2002) dr Tryfonidou specialized in Surgery of companion animals with an intensive 4-year clinical program that was successfully completed with an examination from the European board of specialized veterinary surgeons (ECVS) in 2007. 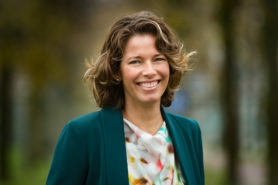 Thereafter, she received a contract to concentrate more on research in combination with clinical work and as off 2010 she is for 100% appointed in orthopaedic research in the focus field “Regenerative Medicine and Stem Cells” of Utrecht Life Sciences. The all-round clinical and biomedical training dr Tryfonidou received and the in depth knowledge of developmental biology and pathophysiology of the musculoskeletal system resulted into a combination of skills useful in an interdisciplinary research. Even more so, it sets dr Tryfonidou at the crossroad of fundamental, translational research and comparative regenerative medicine. In my group we pursue translation of regenerative treatment strategies for degenerative diseases including back pain and osteoarthritis. These two major musculoskeletal disorders are commonly encountered in human, canine, and equine patients causing extensive disability and reduced quality of life. On the course of development and translation we combine our multidisciplinary background involving extensive experience with animal models (experimental animals and veterinary patients), unique expertise for biomolecular techniques of “non-human species” like the dog and downstream bio-informatics analysis. New treatment strategies implement innovative technological platforms, including drug delivery systems enabling controlled release and personalized 3-D printed constructs. Results of in vitro and in vivo studies are interpreted with a clinical directive and experiments are designed with the translation from bench to bed in mind. Our key-role within the One Medicine research theme is emphasized, amongst others, in the successful collaboration with colleagues from the RMCU, UMCU, including the Dept. Orthopaedics and Dept. Rheumatology & Clinical Immunology, world leading research groups in the field of cartilage research and joint distraction, respectively. Translation is based upon a unique preclinical platform which has been successfully employed for the validation of biomaterials that enable controlled release of anti-inflammatory medication and growth factors (IDiDAS, BMM and ArIADNE, Life Sciences Health initiative). In basic research, we employ development biology and the divergence seen within the canine species to identify and validate regenerative targets by means of “omics” (RNAseq and recently proteomics). Within the ‘William Hunter revisited’ consortium (STW) we study how joint distraction facilitates intrinsic cartilage repair. Ongoing studies funded by the AO Spine Research Network focus on notochordal cell-based technology and tissue-specific progenitor cells. My research group, in collaboration with TU Eindhoven (Prof dr K Ito), pioneers within the international spine society by studying separately the soluble bioactive factors and vesicles secreted by notochordal cells. Tellegen AR, Rudnik-Jansen I, Pouran B, de Visser HM, Weinans HH, Thomas RE, Kik MJL, Grinwis GCM, Thies JC, Woike N, Mihov G, Emans PJ, Meij BP, Creemers LB, Tryfonidou MA. Controlled release of celecoxib inhibits inflammation, bone cysts and osteophyte formation in a preclinical model of osteoarthritis. Drug Deliv. 2018 Nov;25(1):1438-1447. Bach FC, Tellegen AR, Beukers M, Teunissen M, de Vries SAH, Creemers LB, Benz K, Meij BP, Ito K, Tryfonidou MA. Biologic intervertebral disc repair by notochordal cell-derived matrix: from bench towards bedside. Oncotarget. 2018; 9:26507-26526. Tellegen AR, Willems N, Beukers M, Grinwis GCM, Plomp SGM, Bos C, van Dijk M, De Leeuw M, Creemers LB, Tryfonidou MA, Meij BP. Intradiscal application of a PCLA-PEG-PCLA hydrogel loaded with celecoxib for the treatment of back pain: a translational approach. J Tissue Eng Regen Med. 2018 Mar;12(3):642-652. Willems N, Yang HY, Langelaan M, Tellegen A, Grinwis G, Kranenburg HJ, Riemers F, Plomp S, Craenmehr E, Dhert W, Papen-Botterhuis N, Meij BP, Creemers LB, Tryfonidou MA. Biocompatibility and intradiscal application of a thermoreversible celecoxib-loaded poly-N-isopropylacrylamide MgFe-layered double hydroxide hydrogel in a canine model. Arthritis Research & Therapy. 2015, 17:214. Smolders LA, Meij BP, Onis D, Riemers FM, Bergknut N, Wubbolts R, Grinwis GC, Houweling M, Groot Koerkamp MJ, van Leenen D, Holstege FC, Hazewinkel HAW, Creemers LB, Penning LC, Tryfonidou MA. Gene expression profiling of early intervertebral disc degeneration reveals a down-regulation of canonical Wnt signaling and caveolin-1 expression: implications for development of regenerative strategies. Arthritis Research & Therapy. 2013 Jan 29;15(1):R23.